Don’t email Brian and call him ‘Mr Cox’. It gives him a bad hair day. When I was an undergraduate student, email was still not widely used, and the idea of emailing a lecturer or professor would have been quite daunting. Times have changed however, and nowadays most academics deal with a steady stream of emails from students throughout the year. This is a good thing in many ways; it helps to break down barriers between the staff and students and can be a very efficient way to communicate. Unfortunately many students don’t follow some basic rules of general politeness when contacting staff and this leads to faculty members getting irritated, and students receiving witheringly sarcastic responses or links to let me Google that for you. Here are a few pieces I’ve collected that set out precisely how best to communicate with your advisor, lecturer or professor. First of all, we have a guide from Wellesley College titled How to Email Your Professor, shared on Twitter by Tom Hartley. Tom also went to the bother of conducting a survey about this kind of thing, and presented the results on his blog. He highlights some interesting cultural differences, particularly between the UK and the US – well worth reading through. Next, is another set of guidelines from Akira O’Connor, also with some interesting contributions from others in the comments. Last is a really terrific set of slides by Cedar Riener, which you can find here. He also provides a sample ‘How to miss a class’ e-mail, with added annotations here. Brilliant. 1) Be polite, and relatively formal (at least at first). 2) Don’t ask stupid questions. 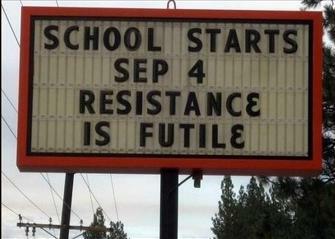 3) Don’t make stupid (i.e. any) spelling and grammar mistakes. 4) For the love of all that is good and holy, get the name and title of the person you’re emailing correct. How hard can that be, eh? Somebody asked me about using a voice key device the other day, and I realised it’s not something I’d ever addressed on here. 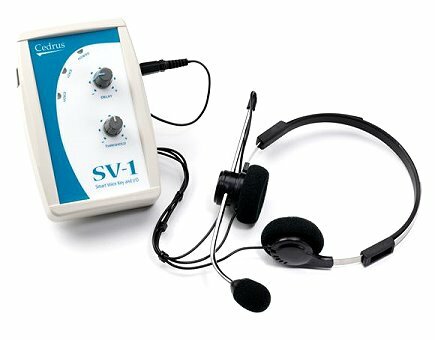 A voice key is often used in experiments where you need to obtain a vocal response time, for instance in a vocal Stroop experiment, or a picture-naming task. There are broadly two ways of doing this. The first is easy, but expensive, and not very good. The second is time-consuming, but cheap and very reliable. The first method involves using a bit of dedicated hardware, essentially a microphone pre-amp, which detects the onset of a vocal response, and sends out a signal when it occurs. The Cedrus SV-1 device pictured above is a good example. This is easy, because you have all your vocal reaction times logged for you, but not totally reliable because you have to pre-set a loudness threshold for the box, and it might miss some responses, if the person just talks quietly, or there’s some unexpected background noise. It should be relatively simple to get whatever stimulus software you’re running to recognise the input from the device and log it as a response. The other way is very simple to set up, in that you just plug a microphone into the sound card of your stimulus computer and record the vocal responses on each trial as .wav files. Stimulus software like PsychoPy can do this very easily. 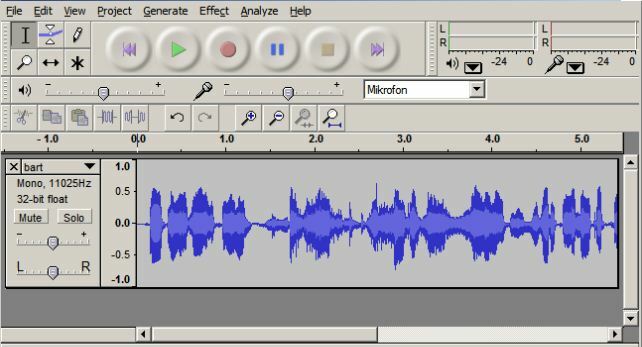 The downside to this is that you then have to take those sound files and examine them in some way in order to get the reaction time data out – this could mean literally examining the waveforms for each trial in a sound editor (such as Audacity), putting markers on the start of the speech manually, and calculating vocal RTs relative to the start of the file/trial. This is very reliable and precise, but obviously reasonably time-consuming. Manually putting markers on sound files is still the ‘gold standard’ for voice-onset reaction times. Ideally, you should get someone else to do this for you, so they’ll be ‘blind’ to which trials are which, and unbiased in calculating the reaction times. You can also possibly automate the process using a bit of software called SayWhen (paper here). Which method is best depends largely on the number of trials you have in your experiment. The second method is definitely superior (and cheaper, easier to set up) but if you have eleventy-billion trials in your experiment, manually examining them all post hoc may not be very practical, and a more automatic solution might be worthwhile. 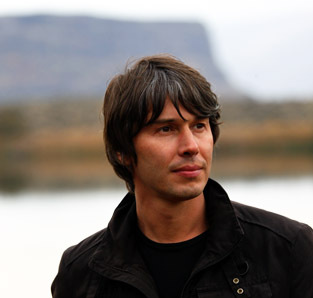 If you were really clever you could try and do both at once – have two computers set up, the first running the stimulus program, and the second recording the voice responses, but also running a bit of code that signals the first computer when it detects a voice onset. Might be tricky to set up and get working, but once it was, you’d have all your RTs logged automatically on the first computer, plus the .wav files recorded on the second for post hoc analysis/data-cleaning/error-checking etc. if necessary. Two researchers have pointed out in the comments, that a system for automatically generating response times from sound-files already exists, called CheckVocal. It seems to be designed to work with the DMDX experimental programming system (free software that uses Microsoft’s DirectX system to present stimuli). Not sure if it’ll work with other systems or not, but worth looking at… Have also added the information to my Links page. Hi kids. Two new pieces of stats/plotting software for you, plus some other stuff. First up is a new (to me, anyway) scientific plotting package called Veusz. It’s written in Python, is completely free and open-source, works with any OS, and basically looks pretty useful. I’ve been using Prism for a while now, but I’ll definitely try out Veusz next time I need to do some plotting – would prefer to use something open-source. The new statistics software is called Wizard, and is unfortunately a paid application, and just developed for Macs. If you’re dissatisfied with SPSS (and let’s be honest, who isn’t?) it might be worth the $79 price though. Haven’t tried it out yet personally, but it looks really, really nice in terms of the interface, and seems fairly comprehensive in terms of features as well. Definitely one to think about for Mac users. Next up is a new reference manager called Paperpile. I’m a big fan of Mendeley, but some of Paperpile’s features are pretty attractive – it lives as a Chrome extension, and uses Google Drive for online storage of the PDFs. Pretty nice. Unfortunately it’s still in a private Beta phase and will cost $29/per year when it’s released. Lastly, a couple of packages for neuroimagers. I’ve just been made aware of a really good collaborative, open-source software project for the analysis of EEG/MEG data – called BrainStorm. Looks like a very capable suite of tools. I’ve also just come across the PyMVPA project, which does exactly what it says on the tin – Multivariate Pattern Analysis in Python. Nice. 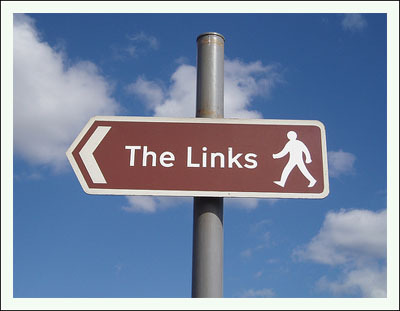 All of these links, and many, many more can of course be found on my newly-updated Links page. It’s always exciting when you find a new piece of cool software to play with, and even more so when what you’ve found is totally free, open-source, and available on all platforms. 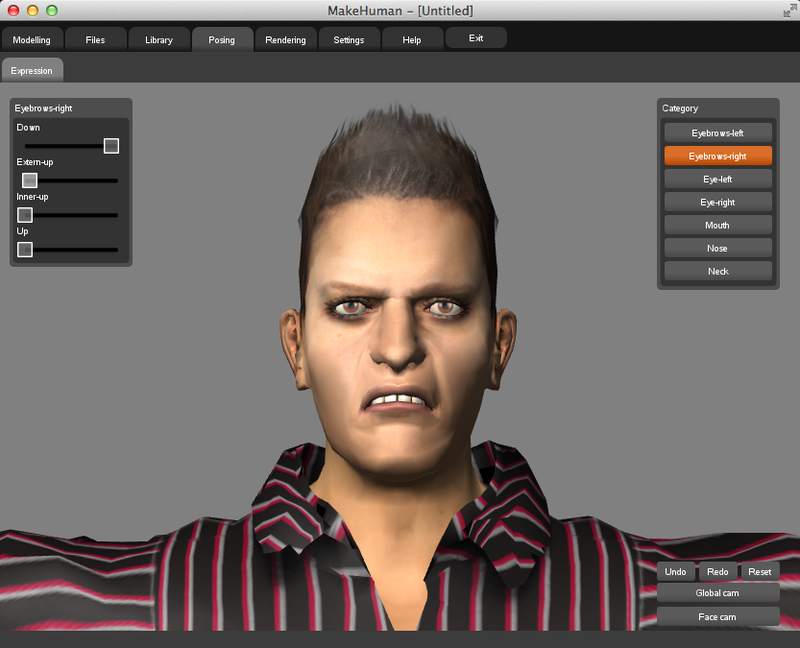 So it is with MakeHuman – an utterly awesome bit of kit. 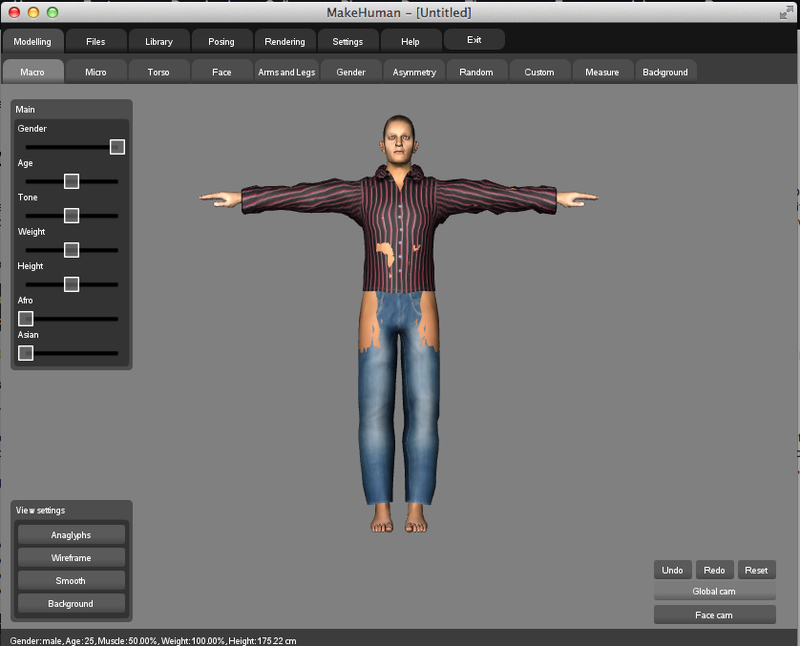 I wrote a piece before about FaceGen, which is also pretty cool, but MakeHuman takes it to the next level, by modelling all kinds of body characteristics as well as faces, and, of course, doing it all for free. Pretty cool indeed. This could potentially be a massively useful tool for people interested in face/body perception – using this, one could generate a large number of highly-controlled experimental stimuli that just differ in one aspect (say, weight, or race… whatever) very easily and quickly. Download it and have a play around! I’ve mentioned OpenSesame briefly on here before, but for those of you who weren’t keeping up, it’s a pretty awesome, free psychology experiment-developing application, built using the Python programming language, and it has a lot in common with PsychoPy (which is also awesome). The recently-released new version of OpenSesame has just taken an important step, in that it now supports the Android mobile operating system, meaning that it can run natively on Android tablets and smartphones. As far as I’m aware, this is the first time that a psychology-experimental application has been compiled (and released to the masses) for a mobile OS. This is cool for lots of reasons. It’s an interesting technical achievement; Android is a very different implementation to a desktop OS, being focused heavily on touch interfaces. Such interfaces are now ubiquitous, and are much more accessible, in the sense that people who may struggle with a traditional mouse/keyboard can use them relatively easily. Running psychology experiments on touch-tablets may enable the study of populations (e.g., the very young, very old, or various patient groups) that would be very difficult with a more ‘traditional’ system. Similarly, conducting ‘field’ studies might be much more effective; I can imagine handing a participant a tablet for them to complete some kind of task in the street, or in a shopping mall, for instance. Also, it may open up the possibility of using the variety of sensors in modern mobile devices (light, proximity, accelerometers, magnetometers) in interesting and creative ways. Finally, the hardware is relatively cheap, and (of course) portable. 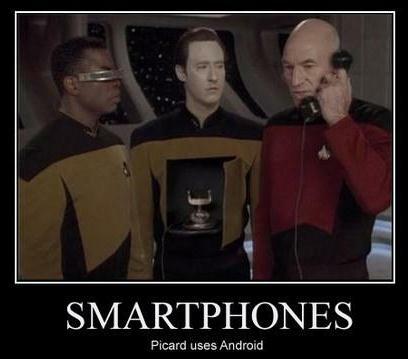 I’m itching to try this out, but unfortunately don’t have an Android tablet. I love my iPad mini for lots of reasons, but the more restricted nature of Apple’s OS means that it’s unlikely we’ll see a similar system on iOS anytime soon. So, very exciting times. Here’s a brief demo video of OpenSesame running on a Google Nexus 7 tablet (in the demo the tablet is actually running a version of Ubuntu Linux, but with the new version of OpenSesame it shouldn’t be necessary to replace the Android OS). Let me know in the comments if you have any experience with tablet-experiments, or if you can think of any other creative ways they could be used. Researchers typically use a lot of different pieces of software in the course of their work; it’s part of what makes the job so varied. Separate packages might be used for creating experimental stimuli, programming an experiment, logging data, statistical analysis, and preparing work for publication or conferences. Until fairly recently there was little option but to use commercial software in at least some of these roles. For example, SPSS is the de facto analysis tool in many departments for statistics, and the viable alternatives were also commercial – there was little choice but to fork over the money. Fortunately, there are now pretty viable alternatives for cash-strapped departments and individual researchers. 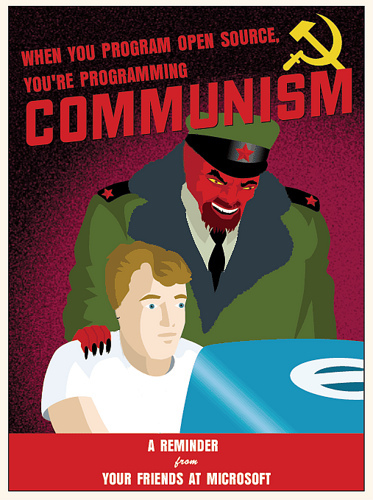 There’s a lot of politics around the open-source movement, but for most people the important aspect is that the software is provided for free, and (generally) it’s cross-platform (or can be compiled to be so). All that’s required is to throw off the shackles of the evil capitalist oppressors, or something. So, there’s a lot of software listed on my Links page but I thought I’d pick out my favourite bits of open-source software, that are most useful for researchers and students in psychology. First up – general office-type software; there are a couple of good options here. The Open Office suite has been around for 20 years, and contains all the usual tools (word processor, presentation-maker, spreadsheet tool, and more). It’s a solid, well-designed system that can pretty seamlessly read and write the Microsoft Office XML-based (.docx, .pptx) file formats. The other option is Libre Office, which has the same roots as Open Office, and similar features. Plans are apparently underway to port Libre Office to iOS and Android – nice. The other free popular options for presentations is, of course, Prezi. There are lots of options for graphics programs, however the two best in terms of features are without a doubt GIMP (designed to be a free alternative to Adobe Photoshop) and Inkscape (vector graphics editor – good replacement for Adobe Illustrator). There’s a bit of a steep learning curve for these, but that’s true of their commercial counterparts too. Programming experiments – if you’re still using a paid system like E-Prime or Presentation, you should consider switching to PsychoPy – it’s user-friendly, genuinely cross-platform, and absolutely free. I briefly reviewed it before, here. Another excellent option is Open Sesame. For statistical analysis there are a couple of options. Firstly, if you’re a SPSS-user and pretty comfortable with it (but fed up of the constant hassles of the licensing system), you should check out PSPP; a free stats program designed to look and feel like SPSS, and replicate many of the functions. You can even use your SPSS syntax – awesome. The only serious issue is that it doesn’t contain the SPSS options for complex GLM models (repeated measures ANOVA, etc.). Hopefully these will be added at some future point. The other popular option is the R language for statistical computing. R is really gaining traction at the moment. The command-line interface is a bit of a hurdle for beginners, but that can be mitigated somewhat by IDEs like R-Commander or RStudio. For neuroscience there’s the NeuroDebian project – not just a software package, but an entire operating system, bundled with a comprehensive suite of neuroscience tools, including FSL, AFNI and PyMVPA, plus lots of others. There really are too many bits of open-source neuro-software to list here, but a good place to find some is NITRC.org. So, there you are people; go open-source. 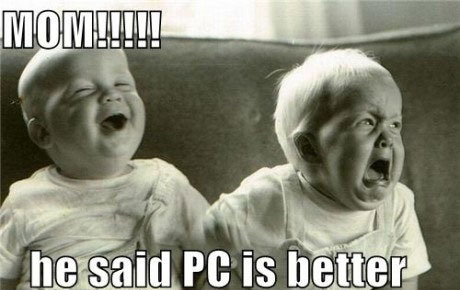 You have nothing to lose but your over-priced software subscriptions. 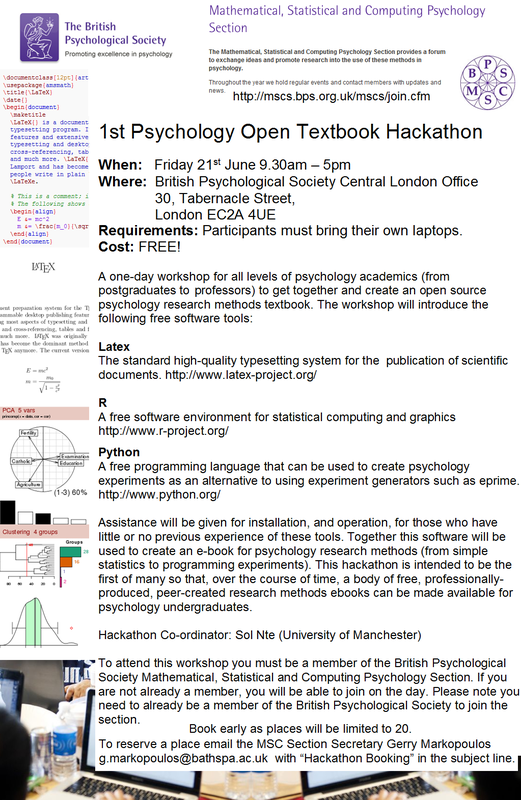 Very exciting news here: I’ve just been invited to the first British Psychological Society (Maths, Statistics and Computing Section) Psychology open textbook hackathon! Inspired by this event (where people got together and wrote an open-source maths textbook in a weekend) the day aims to raise awareness and skills, as well as perhaps produce some usable output. The organisers are Thom Baguley of Nottingham Trent University (and the Serious Stats blog and book) and Sol Nte of Manchester University. They’ve very kindly invited me as a guest, so I’ll be hanging out and learning some new tricks myself, I’m sure. 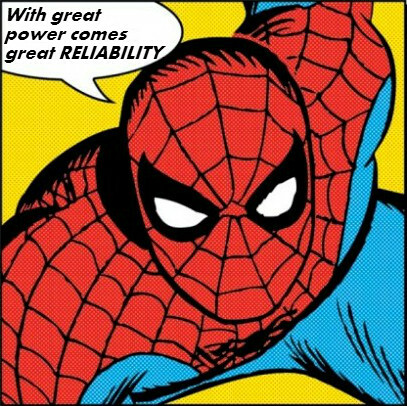 Statistical Spidey knows the score. An article was published in Nature Reviews Neuroscience yesterday which caused a bit of a stir among neuroscientists (or at least among neuroscientists on Twitter, anyway). The authors cleverly used meta-analytic papers to estimate the ‘true’ power of an effect, and then (using the G*Power software) calculated the power for each individual study that made up the meta-analysis, based on the sample size of each one. Their conclusions are pretty damning for the field as a whole: an overall value of 21%, dropping to 8% in some sub-fields. This means that out of 100 studies that are conducted into a genuine effect, only 21 will actually demonstrate it. The article has been discussed and summarised at length by Ed Yong, Christian Jarrett, and by Kate Button (the study’s first author) on Suzy Gage’s Guardian blog, so I’m not going to re-hash it any more here. The original paper is actually very accessible and well-written, and I encourage interested readers to start there. It’s definitely an important contribution to the debate, however (as always) there are alternative perspectives. I generally have a problem with over-reliance on power analyses (they’re often required for grant applications, and other project proposals). Prospective power analyses (i.e. those conducted before a piece of research is conducted, in order to tell you how many subjects you need) use an estimate of the effect size you expect to achieve – usually derived from previous work that has examined a (broadly) similar problem using (broadly) similar methods. This estimate is essentially a wild shot in the dark (especially because of some of the issues and biases discussed by Button et al., that are likely to operate in the literature), and the resulting power analysis therefore tells you (in my opinion) nothing very useful. Button et al. get around this issue by using the effect size from meta-analyses to estimate the ‘true’ effect size in a given literature area – a neat trick. The remainder of this post deals with power-issues in fMRI, since it’s my area of expertise, and necessarily gets a bit technical. Readers who don’t have a somewhat nerdy interest in fMRI-methods are advised to check out some of the more accessible summaries linked to above. Braver readers – press on! An alternative approach used in the fMRI field, and one that I’ve been following when planning projects for years, is a more empirical method. Murphy and Garavan (2004) took a large sample of 58 subjects who had completed a Go/No-Go task and analysed sub-sets of different sizes to look at the reproducibility of the results, with different sample sizes. They showed that reproducibility (assessed by correlation of the statistical maps with the ‘gold standard’ of the entire dataset; Fig. 4) reaches 80% at about 24 or 25 subjects. By this criterion, many fMRI studies are underpowered. While I like this empirical approach to the issue, there are of course caveats and other things to consider. fMRI is a complex, highly technical research area, and heavily influenced by the advance of technology. MRI scanners have significantly improved in the last ten years, with 32 or even 64-channel head-coils becoming common, faster gradient switching, shorter TRs, higher field strength, and better field/data stability all meaning that the signal-to-noise has improved considerably. This serves to cut down one source of noise in fMRI data – intra-subject variance. The inter-subject variance of course remains the same as it always was, but that’s something that can’t really be mitigated against, and may even be of interest in some (between-group) studies. On the analysis side, new multivariate methods are much more sensitive to detecting differences than the standard mass-univariate approach. This improvement in effective SNR means that the Murphy and Garavan (2004) estimate of 25 subjects for 80% reproducibility may be somewhat inflated, and with modern techniques one could perhaps get away with less. The other issue with the Murphy and Garavan (2004) approach is that it’s not very generalisable. The Go/No-Go task is widely used and is a ‘standard’ cognitive/attentional task that activates a well-described brain network, but other tasks may produce more or less activation, in different brain regions. Signal-to-noise varies widely across the brain, and across task-paradigms, with simple visual or motor experiments producing very large signal changes and complex cognitive tasks smaller ones. Yet another factor is the experimental design (blocked stimuli, or event-related), the overall number of trials/stimuli presented, and the total scanning time for each subject, all of which can vary widely. The upshot is that there are no easy answers, and this is something I try to impress upon people at every opportunity; particularly the statisticians who read my project proposals and object to me not including power analyses. I think prospective power analyses are not only uninformative, but give a false sense of security, and for that reason should be treated with caution. Ultimately the decision about how many subjects to test is generally highly influenced by other factors anyway (most notably, time, and money). You should test as many subjects as you reasonably can, and regard power analysis results as, at best, a rough guide.